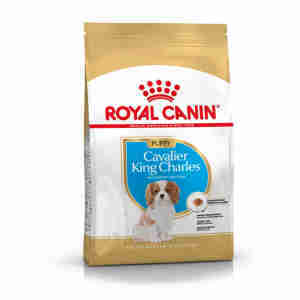 Royal Canin Cavalier King Charles Junior is a complete dog feed specially formulated for Cavalier King Charles Spaniels puppies up to 10 months old. This formulation contains the nutrients necessary to help support good cardiac function : adapted content of minerals, EPA & DHA, taurine, L-carnitine and antioxidants. EXCLUSIVE KIBBLE: DENTAL HEALTH - The kibble’s shape, size, texture and formula are adapted to the Jack Russell Terrier dog. NATURAL DEFENSES - This formula helps support the Cavalier King Charles Spaniel puppy’s natural defences. Vitamin A: 30500 IU, Vitamin D3: 800 IU, E1 (Iron): 47 mg, E2 (Iodine): 4.7 mg, E4 (Copper): 9 mg, E5 (Manganese): 61 mg, E6 (Zinc): 183 mg, E8 (Selenium): 0.08 mg, Taurine: 2.1 g, L-carnitine: 400 mg - Technological additives: Pentasodium triphosphate: 3.5 g - Preservatives - Antioxidants. Protein: 30% - Fat content: 18% - Crude ash: 7.5% - Crude fibres: 1.6% - EPA & DHA: 4 g/kg. *L.I.P. : protein selected for its very high assimilation. We have a very healthy, happy and energetic puppy who is approaching 10 months old - I am now going to order the adult food because we are so delighted with Royal Canin food.